Honda City Promotion for May 2013 is here! Any purchase made within this month, you are entitled for great rebate as advertised on the table below. On top of that, we can also offer you special free gifts which are listed on our Honda City Price Quotation. Click here to download the Price Quotation. * Graduate scheme / 100% loan can be arranged as long as your net salary is higher than RM 2,500. We have emailed you the quotation for Honda City. Let us know if you are interested. Hi, is the city VA still available? pls qoute me the price for City VA.
is this discount effect 6 free service? Bro, wanted to book city VA , not sure bout standard booking procedure, first time buying car, need advise, How long need to wait after booking? and how much i need to pay for booking? I can afford 10% dp, so what will be interest rate? Hi there, all you need to do is to provide us a copy of your IC and a payment of RM 1,000 for the booking. The estimated interest rate for 10% down payment is from 2.35%. Please check your email for the quotation. I’m interested City E and VA. Pls offer me your best price. Hi CC, we have emailed you the latest promotion. Please check your email. hai…saya seorang guru baru kerja 3 bln…gaji pokok saya 1806 n gaji bersih saya dlm 3200 mcm tu…klau saya nak memiliki honda city VA adakah perlu guarantor?? ?blehkah saya apply 100% loan?? ?brpkah interest skrg??? Hi Raf, honda city VA tidak lagi ada dipasaran. Model ini adalah limited. Berdasarkan gaji you, kemungkinan besar you perlukan penjamin kerana gaji basic you rendah. Sila check email you untuk maklumat lanjut. HI, looking for Honda City E spec. Salary RM3.2k per month. Will give RM40k downpayment, and the rest loan installment for 5 years. Can email me the price of the car and loan installment (best deal)? And what free gifts? Shi…saya baru pergi showroom dekat kuching. Tapi salesman cakap pada saya rebate Rm2000 sahaja?? Hanya dealer kami yang menawarkan RM 3,000 tetapi dealer kami hanya beroperasi di Semenanjung sahaja. Please email me the quotation both Hondy City 1.5 E and 1.5 S. Planning to buy either one. Loan 90%. Any further discount? Wasalam Syira, we have emailed you the latest price for Honda City. Hubungi kami jika you ada sebarang soalan. Salam, your Perodua Myvi is fairly new and you need to check the loan settlement for your Myvi before you proceed. Hi Lee, we have sent you the quotation. All the details should be available there. Hi, can you please explain more regarding the Graduate scheme / 100% loan for Honda City? Im currently earning more than 4k and would like to apply the Graduate scheme / 100% loan. Hi Sir, do you have a degree/diploma? If yes, it should be fine to apply loan for this model. RM 3,000 seperti yang dinyatakan. Setiap dealer menawarkan promosi yang berlainan. Sila hubungi kami jika you ada sebarang soalan. Slm. Interested in honda city S. Salary 4k p month. Downpayment 10%, 9year loan. Can u email me price quotation pls? 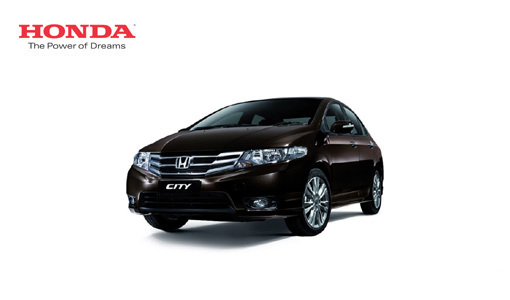 Wasalam, we have emailed you the latest price and promotions for Honda City. Please contact us if you have any questions. i am not a fresh graduate. been working almost one year in this new company. Hi Kim, it should be fine for you to get this model. Check your email for more info on the latest promotion. Im interested to buy the Honda City E. Im looking for graduate scheme for it. Kindly email me the quotation. hi, I am interest to buy Honda City E spec from u. Now Honda have the 1 year free Roadtax + insurance promotion (as website show). Is it your offer 3k include the roadtax + insurance? Hi there, we don’t offer the free insurance and road tax. But the total amount is still lower than RM 3,000 rebate that we are offering. Please check your email for more info. Wasalam, kami dah berikan quotation. Sila hubungi kami jika you ada sebarang soalan. sy dr langkawi dah boking bulan 5..just nk tahu brapa diskaun yg saya boleh dpt kt sini?confius..
Tu you kena berhubung dengan dealer you kerana pricing berbeza di sini. Hi, don’t worry about our promotion, we have providing the best deal for honda City. Please check your email for the latest price quotation and promotion. oh ya when will the next city model release? Please check your inbox again or in your spam folder. Hi Rathika, it depends on your loan settlement balance. If it is still high, we would advise you to keep it for few years. Hye..i’m currently looking for honda city E. Basic salary 3.5K. D/P 15K. 7 or 9 years. What are the best price and packages you can give and also if included with bodykit? How much the monthly instalment? What is best interest rate that you could give? Thx. Hi there, we have emailed you the details. The lowest interest rate you can get is around 2.38-2.5% depending on bank’s approval. I have 2008 1.3 myvi with 7years loan. Currently the loan has 2 years balance. Can I trade it with good price? I want the honda s as replacement. Please email me the trade price + the installment for new honda city. Anyway I heard the rumors for 2014 honda city more elegance and sophisticated. Any possible date it will be launch? Thanks. Hi Krystal, we have sent you the latest price for Honda City. Please take a look. The term and conditions include max age of applicant (30 years old), posses a degree and this is going to be the first car. We have sent you an email for more info. Hi… can you send me latest promotion & price of Honda City? Thanks in advance! Hi avelyn, we have sent you the details for Honda City. Please get back to us if you have any further question. We have emailed you the latest price and promotion for both models. However, based on your basic pay, you are only eligible to get the Honda City. Hi there, I would like to know the latest promo and price for City E/G spec, thanks. Planning to loan Rm 60 K and 5 years for the loan repayment period. What is the best interest rate that i can get ? We have emailed you the quotation. The interest rate should be from 2.35-2.5% depending on bank’s approval. Boleh email kan quotation for Honda City. Basic gaji saya 2.8k …. Hi, kami dah emailkan quotation bagi Honda City. I would like to trade in my 2009 viva 1.0.. The full settlement is around 23k. Im interested in city E. My basic salary is 2.1k and the net salary is around 2.4-2.5k. Could u please send me the quotation if I wanna apply for graduate scheme. Am i qualified for that scheme? Hi Ila, you are no longer qualified for the graduate scheme if this car is gonna be your 2nd car. Sorry, I forgot to mention that the car is not under my name. Then that’s totally fine. Please contact us whenever you are ready but please do it asap so that you can enjoy the rebate. Could u please send me the quotation? hi i would like to trade-in my 2006 kancil 850e . The full settlement is around RM9K. I’m interested in city E. & My basic salary is 3.5k. Could u please send me the quotation. am i qualified for 100% loan? Hi Sha, we have emailed the latest price quotation. We can apply for the maximum loan amount and we wonder if this is gonna be your second car with loan under your name. Hi, do u mind to send me ur quotation for City -VA, Thnx a lot. Hi Ade, VA model is no longer available. In two weeks time, Honda will introduce another new model E plus to replace the VA model. This model doesn’t have the RM 3,000 rebate. l like honda city very much. Pleasae send the dtail about honda city E.
Salam, sorry for the delay. Please contact us if you haven’t made any purchase. We have had many buyers from Penang, it shouldn’t be a problem. Just take 55% discount from the total insurance as part of your down payment. As you means in two weeks time, Honda will introduce another new model E plus to replace the VA model, is the price remain or will be higher. How about the spec? Any upgrade? Do you have the new spec list? Yes, it will replace the VA model and the price would be almost the same as VA model. The spec still remain unknown. Wasalam, may us know your net salary after deducting your loan, tax and epf? HI San, we have emailed you the details. Please let us know which loan period fits your budget. Salam, kami dah emailkan quotation bagi Honda City. Loan boleh buat setinggi 100% bergantung kepada budget saudari. Sila hubungi kami jika you ada sbarang soalan. Hello i nak beli city downpayment 30k, loan 9 year, basic rm2500, bleh tolong bg cadangan yg terbaik untuk i? Salam, you bercadang nak ambil model S, E atau E+? Semua nya beza accessories dalaman sahaja. Sila check email you utk dapatkan quotation. Hi. There i would like to find out for modal S,E or E+. Kalau i nak loan 100% and basic i 2920.00 berapa kena bayar instalment for 9 years and minimum down payment berapa? Hi Kay, we have sent you the quotation for all Honda City models. hi.. i’m interested in honda city, can you email the price for all model & berapa kena byr for 9 yrs & minimum downpayment. The lowest down payment is 0%. We have emailed you the details for your reference. Wasalam, kami dah emailkan quotation jika you berminat. Wasalam, rebate tu boleh digunakan utk tambahan bodykit dan accessories lain. Boleh hubungi kami di 019-3559448 jika berminat. Assalam. Sy berminat utk mmbeli honday city grade s + modulo body kit. Baru kerja government 8 bulan. Boleh buat full loan tnpa downpayment 9 tahun/10 tahun x? sy ade personal loan rm853 habis bayar bln 1(loan 10k). Basic rm2.7k + elaun rm2.3 – kwsp rm500 = bersih rm4.5k. ada rebate bulan ni? Kami dah emailkan quotation bagi Honda City. Hi. I,m Jepp, fresh graduate student with basic salary 2350. have working almost 6 month. looking for honda city 1.5 s. Is that posible to my to apply for graduatted scheme? Yes it is possible. Please contact us and check your email for more info. Hi Cery, we have emailed you the latest price quotation for the brand new Honda City. Wasalam, it might be possible if you choose to get Honda City S. Otherwise, you may need to provide a guarantor. Are you willing to pay any down payment? Yes, im planning to pay 20-30% d/p. It is possible? Already compared S and E spec, attracted to E spec. Then that’s possible. Prepare the required documents so that we can proceed with loan application. Im just graduated and currently working with basic Rm3.2k. Im interested with Honda Jazz 1.5L i-vtec. The downpayment will be around 15k and loan for 9 years. Am I eligible for the graduate scheme? Please advice. Hi Nik, we have emailed you the quotation. We’d recommend you to make an early booking to avoid longer waiting period for this model. I have been working close to 3 years with a basic salary of RM3.3k. Plus minus with my monthly claims i will pocket around RM3.1k as my net salary. Thought of putting a d/payment of around 15k with a repayment period of 9 years. Interested in purchasing either the highest spec City or the highest spec Jazz. Kindly advise. Thx. We have emailed you the quotation and please contact us if you plan to get the model. Boleh email kan quotation for Honda City. Kami dah emailkan quotation. Sila check email you. Plz pm me d latest promo 4 city E..
Sure, we have emailed you the price and promotion for the new honda City E.
I m interested in Honda Civic, salary 3k Plus. send me list for city and accord also , thank you. We have sent you quotation for both Honda Civic and Accord. Noted, we have sent you both Honda City and Civic quotations. Can you give me the quotations for honda city and honda civic. I also want to know more about the graduate scheme procedure. Wasalam, we have emailed you the details and please let us know if you have any further question. Interested in Honda City E. Kindly send me the quotation for d/p RM15,000 and 9 years intallment. Hi Chandler, we have sent you all the details. Salam tuan..sya gaji basic 1.750 ..pluss elaub dpt la 2.4k..tp tolak ptng rmh jadi 1.8k.gaji bersih..soaln sya dapt x saya bayr muka 30k untk spec s..tolnn hntr qoutation kt sya. Wasalam, tuan perlukan penjamin jika tuan berminat. Sila check email tuan. I’m interested City E . Pls offer me your best price. Hi Safar, quotation sent together with the latest promotion. Hi Jay, we have emailed you the latest promotion for both Honda City E & S.
is there any 100% loan still for salary more than rm2500? Yup nas, if you go for Honda City, you can use the rebate as part of your down payment. Hi Nike, kami dah emailkan quotation. pls email me new quotation for honda city.thanks. Hi there, we have sent you the latest rebate available for this model. I have savvy and want to trade with city any version. Currently the car loan has 2 years balance. Please PM me your best price. Thank you. What’s your current car model? Please check your email for the quotation. I interested in honda city E..
Pls give me the latest offer n price. Noted, we have emailed you the quotation as requested. I interested in honda city S or E, pls give me the latest offer n price. Yup, we have emailed you the details as requested. Thank you! Hi im interested in honda city S or E, please send me the offer price and quatation. Hi shirley, there is promotion going on now but this Honda City is out of stock. You may want to make an early booking. I’m 25 years old. After graduated 2011, has been working with private sector & now i am working in Government sector for about 4 month. My basic salary RM 2100 + allowance = RM 2800. My net salary RM 2493. Need to know if i am eligible for graduate scheme & 100% loan. My interest car is Honda City E.
Looking forward your feedback soon. Salam, yes you are still eligible to apply for the graduate scheme. Hi, i interested in Honda city E. Can you give me the detail latest offer n price.. I want to ask u about the trade-in price for my old car-MYVI SE1.3 manual.2008. One more thing, can i get full loan? Hi, yes you can get the full loan when you use the rebate as part of your down payment. hi, any honda can be arrange with zero downpayment? Yup, applicable to all cars. hi there, may i have the new qoutation for 2014? honda city. and is it possible for me to get 100% with a salary 2300k per month..? your advice is highly app. Hi, the price is not yet released and you can check your email to get the estimated monthly installment. Sy ingin membeli Honda City 2014. Gaji bersih RM 4500. Blh tlg emelkan the latest promotion through emel? Tq again. Wasalam, kami dah emailkan quotation bagi Honda City terbaru.